Dynamic Web designing is the process of creating a web page which alters as per the inputs entered by the users or the computer program. It shows different contents every time the page is viewed. A page containing dynamic design changes with time or as per the need of the user of the site. There are two variants of dynamic web pages such as Client-side scripting and Server side scripting. These variants help in generating the client-side content at the user’s end and updating essential information automatically at frequent intervals. All dynamic web pages include several web scripting codes such as PHP or ASP. When you access a dynamic web page, the inherent code is analyzed on the server and the resultant HTML code is delivered to your Web browser. Websites including multiple pages can utilize the maximum benefits of dynamic designing as they collect information from a large database. If you are looking for a trustworthy Dynamic Web Designing Services connect with our team of skilled experts at Tech Support Dubai. Give us a call or drop an email to us and allow us to design your website dynamically at an affordable price. 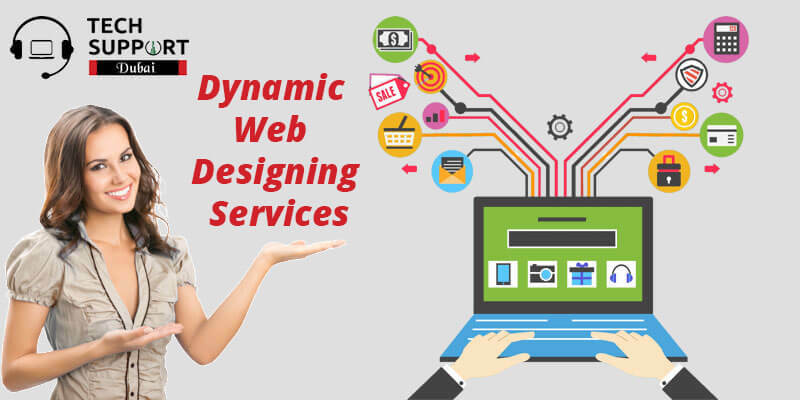 Dynamic Web Designing offers trendy and innovative websites which attract the visitors towards the products and services included in the site. Moreover, most of the websites are now becoming dynamic to sell their products easily over the web. Additionally, it makes the website much interactive for the user by offering live chats, videos, and many other exciting features. You should choose dynamic web designing for the below-mentioned reasons. Having an industry experience of 18+ years, our skilled professionals strive to deliver you an appropriate and interactive website. Our experts have worked on several web development projects for more than a decade. They have also created multiple excellent dynamic websites for multiple business houses across the world. All our designing solutions are budget-friendly which gives a golden opportunity to small businesses to create a firm online presence. In addition, we offer 24*7 customer service through our live chat, phone or e-mail facility to serve our customers. We at Tech Support Dubai offer transparent pricing, on-time delivery, free consultation and money back guarantee. Regular training and feedback from the customer help our experts to improve their skills and service quality. Are you tired of searching Dynamic Web Designing Company in Dubai near your location? We at Tech Support Dubai have a helpline number: 042053349 for you to call irrespective of time and avail quick assistance from our experts. Additionally, you can send a mail to reach our professionals and receive a call back within the next 24 hours. Furthermore, we are available over live chat option. You can reach us via our live chat facility during busy working hours. Connect with us to avail our class-apart service. We also provide Static website redesign service in Dubai.